WELCOME TO THE OFFICIAL ENGLISH FAN-SITE FOR KOYUKI.....公式の歓迎英語 ★こゆき★-ファンサイト..
You wanted it longer and privately! Then Send your messages/comments here!. Advertisements and Spam Messages will automatically deleted and will not entertain. 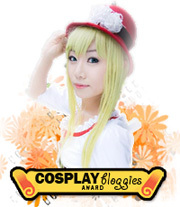 Give this award to all Cosplayer Blog and Cosplay Fansite you know..
Great Cosplayer : Alodia G.
FEEL FREE TO BROWSE OUR COSPLAY ALBUMS! ALL IMAGES ARE OWNED BY KOYUKI..